The decades-long drought in antibiotic discovery could be over after a breakthrough by US scientists. Their novel method for growing bacteria has yielded 25 new antibiotics, with one deemed "very promising". The last new class of antibiotics to make it to clinic was discovered nearly three decades ago. The study, in the journal Nature, has been described as a "game-changer" and experts believe the antibiotic haul is just the "tip of the iceberg". The heyday of antibiotic discovery was in the 1950s and 1960s, but nothing found since 1987 has made it into doctors' hands. Since then microbes have become incredibly resistant. 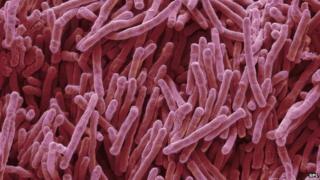 Extensively drug-resistant tuberculosis ignores nearly everything medicine can throw at it. The researchers, at the Northeastern University in Boston, Massachusetts, turned to the source of nearly all antibiotics - soil. This is teeming with microbes, but only 1% can be grown in the laboratory. The team created a "subterranean hotel" for bacteria. One bacterium was placed in each "room" and the whole device was buried in soil. It allowed the unique chemistry of soil to permeate the room, but kept the bacteria in place for study. The scientists involved believe they can grow nearly half of all soil bacteria. Chemicals produced by the microbes, dug up from one researcher's back yard, were then tested for antimicrobial properties. The lead scientist, Prof Kim Lewis, said: "So far 25 new antibiotics have been discovered using this method and teixobactin is the latest and most promising one. "[The study shows] uncultured bacteria do harbour novel chemistry that we have not seen before. That is a promising source of new antimicrobials and will hopefully help revive the field of antibiotic discovery." Tests on teixobactin showed it was toxic to bacteria, but not mammalian tissues, and could clear a deadly dose of MRSA in tests on mice. Human tests are now needed. The researchers also believe that bacteria are unlikely to develop resistance to teixobactin. It targets fats which are essential for building the bacterial cell wall, and the scientists argue it would be difficult to evolve resistance. "Here is an antibiotic that essentially evolved to be free of resistance," said Prof Lewis. "We haven't seen that before. "It has several independent different tricks that minimise resistance development." There are limits to the discovery of the antibiotic teixobactin, which has yet to be tested in people. It works on only Gram-positive bacteria; this includes MRSA and mycobacterium tuberculosis. It cannot penetrate the extra layer of protection in Gram-negative bacteria such as E. coli. But even if their method does mark a new era of antibiotic discovery there are big questions. Sir Alexander Fleming, who discovered penicillin, warned of the dangers of resistance back in his Nobel prize speech in 1945. Yet even now prescriptions in England are rising, with half deemed "inappropriate" and contributing to the problem. But can we be trusted with new antibiotics? Or will we make the same mistakes again? Prof Laura Piddock from the University of Birmingham said it was an "amazing" and "exciting" study and that the tool "could be a game-changer". "The discovery of this new antibiotic, from a new class with a novel mode of action, is very exciting. "I hope that teixobactin will now enter clinical development as the basis for a new drug to treat infections." There is wide concern that the world is cruising into a "post-antibiotic" era. It could leave many common infections untreatable and make many staples of modern medicine - including surgery, chemotherapy and organ transplants - impossible. Prof Mark Woolhouse from the University of Edinburgh added: "What most excites me is the tantalising prospect that this discovery is just the tip of the iceberg." He said it was vital the antibiotic pipeline was reopened "if we are to avert a public-health disaster". Dr James Mason from King's College London said the antibiotic pipeline had "all but dried up". "It's impressive what they've done. From one soil sample they've found one new antibiotic, and their approach opens up a new route to a huge number of potential products. "They have shown that screening soil microorganisms for antibiotics is unfinished business." However, he cautioned that although the new antibiotic had exciting properties, it was too early to conclude it would entirely avoid the development of resistance. The researchers said their discovery was similar to vancomycin. It was discovered in the 1950s, but it took until the late 1980s for resistance to develop. "They argue the delay in resistance is an inherent property, but vancomycin was kept back and not used that extensively," Dr Mason said.